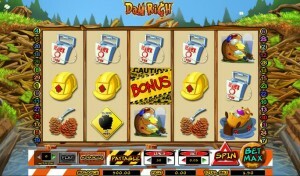 Dam Rich is a slot built around the life of dam builders, the famous beavers that are nature’s hard workers. You will find a Cryptologic slot machine, which focuses on various beaver workers, which shows them as they are working, eating pine cones, the protection equipment that they wear and even the end result of their hard work. The theme is unique as far as I know, and it’s very well handled, so it should be a pleasure to play this slot. The layout is a pretty normal one, using 5 reels and up to 30 active bet lines. 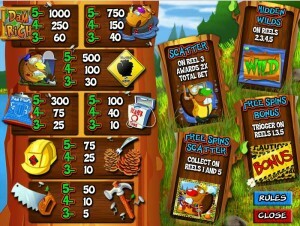 You have free spins that you can trigger, which benefit from the presence of expanding wilds, and then you have scatters and regular/expanding wilds in the base game as well. A $10,000 top prize is offered. 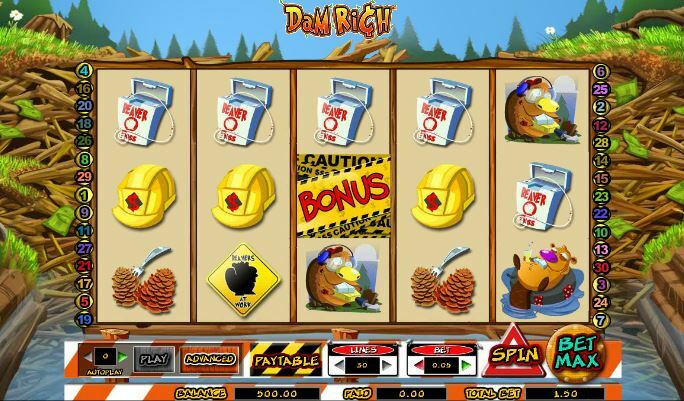 There are about four different features in Dam Rich, including a free spins scatter which you collect, a free spins bonus which is triggered directly, another scatter that awards prizes and there are some hidden wilds as well on some of the reels. The base game makes use of hidden wilds, which can show up on the last four reels of the slot. These particular wilds are regular ones, nothing truly special about them. They substitute for other symbols, allowing you to get more wins in the long run. There are also hidden expanding wilds that appear in the game. These are symbols which are only available on the middle three reels. You can get multiple expanding wilds during the same round, it all depends on your luck. The beaver with the snorkeling equipment is a scatter that awards prizes whenever a single symbol of this type is present, as long as it’s on the 3rd reel. If this happens, you get the equivalent of double the total bet as a prize. The slot’s free spins are started whenever the Bonus symbol is present at the same time on three reels, the 1st, 3rd and 5th ones. These are scatter symbols, so it doesn’t matter where exactly the symbols are, as long as they are on all three reels. This feature will offer you a chance to get up to 20 free spins. 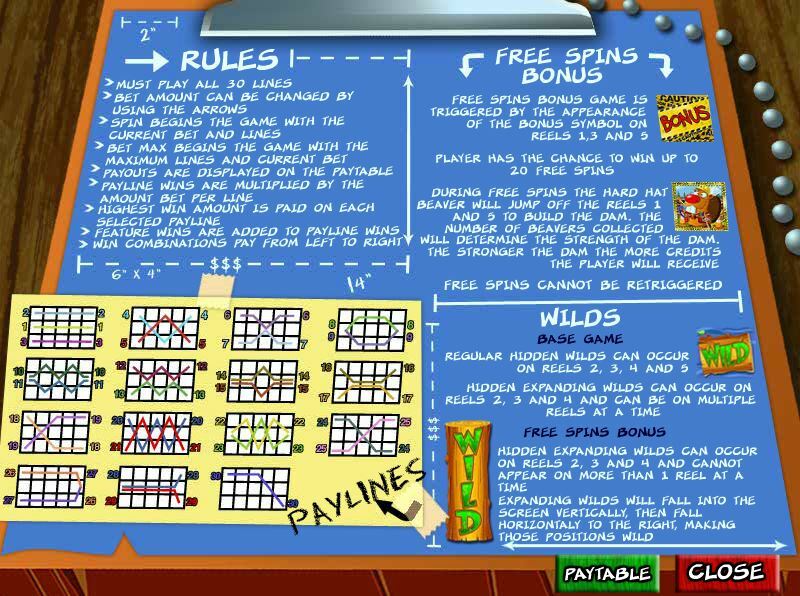 There is no option to retrigger the free spins. 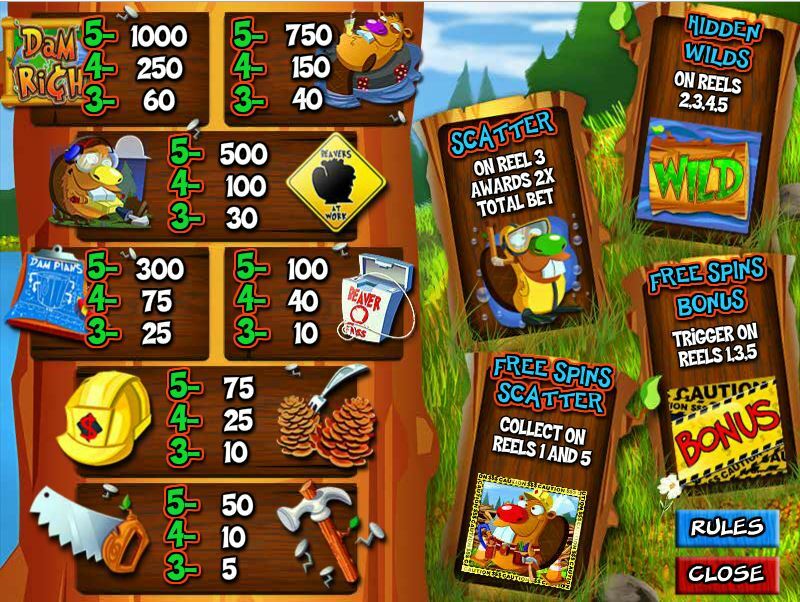 For the duration of the free spins, the Hard Hat Beaver is a scatter symbol which you can collect when appearing on the 1st and 5th reels. These beavers will work on the dam, making it stronger, which brings better prizes as you play. 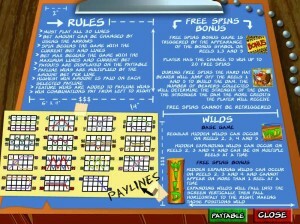 The free spins also take advantage of hidden expanding wilds, which appear on reels 2, 3 and 4. You only get one expanding wild at a time though, so you can’t have two or three in the same round. The initial fall of the wilds will be in vertical mode, after which they will fall on the right side, turning those positions into wilds. If you look at the bottom of the reels, you will notice the Lines and the Bet sections. The first one normally allows you to select a number of paylines, but here it’s fixed at 30. The second one modifies the line bet, starting at $0.01 and going up to $10. The maximum bet is worth $300. The top prize is a rather disappointing 1,000x, which gives you up to $10,000. The line bet is the one that decides exactly how much the prize is worth. You get a nicely designed game, with a theme that isn’t very common, so on the graphics side of things it does quite well. Cryptologic’s designers are known for the quality of the games they release, and while this isn’t the best title they ever put out, it’s definitely in the top half of their collection. There are all sorts of beavers present, some working on the dam, others snorkeling or acting as bosses. I appreciated seeing only themed symbols here, nothing being out of place on the paytable. Symbols: Beaver Worker (scatter), Warning Tape Bonus (scatter), Snorkeling Beaver (scatter), Piece of wood (wild), Dam Rich Logo (1,000x), Beaver Boss (750x), Beaver with pickhammer (500x), Beavers at work sign (500x), Dam Plans (300x), Beaver box (100x), Protection hat (75x), Pine Cones (75x), Saw (50x) and Hammer (50x). The theme is a lot of fun, interesting and well enough handled that it will make you smile. The top prize is the only one that I don’t like, but the overall experience should be a positive one. Dam Rich can be found at any Cryptologic casino, where you get a chance to play it for real money or in free mode.